Australian Football is the national game of Australia. 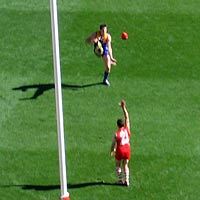 Although Australian Football is the official name, the sport is commonly called Australian Rules Football or Aussie Rules, AFL (after the name of the national league) or just football or footy. Outside of Australia it is mostly played by expat Australians. There are many Australian Football leagues around the world, including some in Europe and North America. SCIENCE: On this site you will find a great article about nutrition for AFL. There is also a list of the tests conducted at the AFL Draft Camp and info about fitness for AFL. HISTORY: Read about the origins of AFL in Australia, and team profiles of each AFL club. RESOURCES: Check out these AFL player profiles and team songs. The finals system is explained. AFL Lists: AFL Premiers, Brownlow Medal winners, and the grand Final Sprint winners. The losers are here too - see the list of Wooden Spoon winners for coming last in the AFL competition. IMAGES: Clipart of AFL players and equipment, AFL Photo Collection. INFORMATION: collection of AFL Trivia, quotes and books for sale. The MCG is the home of AFL and cricket in Australia. Did you know that AFL was once demonstration sport at the Olympic Games? read the AFL entries on the sporting blog. AFL Polls, including who is/was the greatest ever AFL player?